La Pinéa is the shapely peak on the south ridge of Charmant Som, prominent on the skyline from many directions. It isn't very high (1771 m), and it is very accessible so most of the ascents described elsewhere are short half-day walks. This route, however, takes the opportunity to explore a little more of the Charmant Som massif, and takes a little longer. One half hour section follows a forestry track which can get very muddy, so it is best left for a dry spell. In essence, the route leaves the car on the south ridge of Charmant Som, descends to the Col de la Charmette to the west, contours south through the forest, and then ascends directly to the summit of la Pinéa from below the west cliffs. A return is then made along the ridge back to the car, completing a satisfying circuit (map). Drive up the road from the Col de Porte towards Charmant Som, and soon after it emerges from the forest you will see a car park on the right (1620 m, grid ref. UTM 31T 71594 50212). Park here, where you will get a view of the day's objective. The view of Chamechaude is also excellent from here, although Charmant Som looks a bit of a lump from this angle. A few metres up the road a track takes off to the left. Follow this for some 10 minutes round a couple of bends, and then take a path leading into the forest on the right. The next half an hour is on a pleasant path zig zagging down the flanks of the valley. A forest track is then intercepted and followed for ten minutes to the Col de la Charmette (1260 m), reached within an hour of leaving the car park. This is the meeting point for a number of paths, so it is just as well as to get your bearings. There is a signpost marked la Fontaine Claire pointing vaguely in the direction of two tracks on the left. We need the second, which is marked with a yellow paint mark on a tree. This track sees some heavy forestry operations and for the next 40 minutes can get very muddy, which is why the walk is best left for a dry spell. It's a good example of how what was probably once a good forest path has been decimated by modern forestry equipment. With care, however, you can avoid the worst bits, and when you pass to the left of a cabin (unmarked on the map), it is all behind you. A couple of minutes after the cabin another junction is reached - la Fontaine Claire (1250 m). Our way is to the left, a track which is signposted la Pinéa. After a further ten minutes, you will meet a large clearing with a hut straight on, and the main track veering right. To avoid a large loop in the track, head diagonally across the clearing to the right, where a thin path may be found heading downhill in a small damp gully. This soon rejoins the main track which we follow to a small abri (bivouac hut), an hour after leaving la col de la Charmette. This is in an exquisite location - an island in a sea of hayfields nestling beneath the cliffs of la Pinéa - and it is the perfect place for lunch. From the abri, continue along the road for a few metres and take the track off to the left that circumnavigates a hay meadow. The path enters the forest and a few minutes later a waymarked path leads off to the right, soon after signposted to la Pinéa. This crosses the track again, and starts to ascend along the base of a cliff, and then gently zig zags through the forest before emerging to be confronted by an unexpected view of the western summit cliffs. A few minutes later the crest is reached, in an area of rocky outcrops. The path from the Charmant Som road can be seen a few metres below. 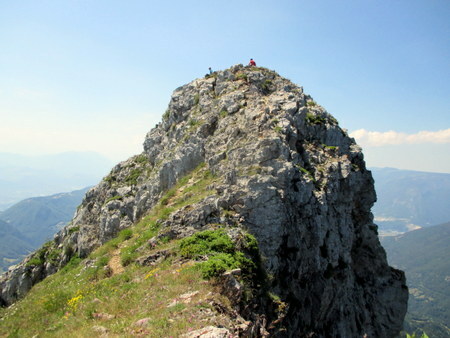 From here, the summit is an easy scramble up to the right (Difficulty 2), and is reached after a 75 minute ascent from the abri. This scramble can be avoided by dropping down to the other path and following it round by a less direct but easier (albeit polished) route. The views from the summit in all directions are superb. Mont Blanc is visible hanging over the Roman Inscription, and most of the major tops of Chartreuse are clearly seen. Below is the abri where we had lunch, nestling in its sea of hay meadows. This is a place to linger and enjoy. The journey back to the car is simply a question of following the Tour de Chartreuse back along the ridge for an hour or so to the north, taking time to admire the views.